The BBC Trust has called for the BBC to remain a "universal and independent broadcaster, which aims to provide something for everyone." The statement forms part of the publication of the BBC Trust's response to the Government's Green Paper on the BBC, which coincides with the launch of the Trust's "Tomorrow's BBC" public consultation. The Trust says its research over the past eight years shows that its stance is "widely supported by the BBC’s audiences." And, in a move that would stop the secret licence fee deals of 2010 and 2015, the BBC Trust says it also wants a legal obligation to force a public consultation before any future funding deals. It says this obligation would form "clear boundaries around the Government's involvement in the BBC". Earlier this month, the BBC Trust said it couldn't endorse the way an agreement about the licence fee had been reached ahead of the summer Budget, because the public hadn't been involved. Alongside its Green Paper response (published in full here) the Trust has set out a series of questions asking audiences for their views on the BBC, such as its range of services and the quality of what it provides. 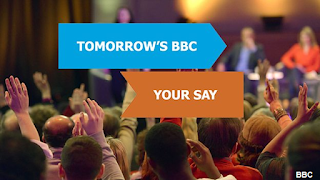 This starts the first phase of the what the BBC Trust calls its "most comprehensive programme of public consultation yet, which will also include extensive audience research, events in partnership with external organisations, and online engagement." "Charter Review will ultimately decide what kind of programmes and services audiences get for the BBC they pay for, so the most important voice in the debate is that of the public and we’ll ensure it is heard. We welcome the Government’s recognition of the importance of the BBC and the value that it brings – that value is built on its providing something for everyone and its independence, which we know audiences support." The Government is also asking for views from the public about the BBC, but the consultation, launched last week by the Department for Culture, Media and Sport has been critised by some for not being easy to understand for those outside of the media industry. Critics wonder whether or not the wider public will want to answer questions such as "How should the system of content production be improved through reform of quotas or more radical options? ", or whether such questions will limit the consultation responses to certain companies and individuals with experience in the media industry. Audiences can take part by in the Tomorrow's BBC consultation from the BBC Trust by visiting www.bbc.co.uk/tomorrowsbbc, emailing tomorrow@bbc.co.uk, tweeting @tomorrowsbbc or with #tomorrowsbbc or by calling 0800 0680 116 if you require a hard copy, audio or braille version of the consultation. The separate Department for Culture, Media and Sport (DCMS) consultation is available at on the gov.uk website.